The dog days of summer are upon us, perfect for soaking up the sun at the beach, exploring the coastline by boat, and dining under the twinkling canopy of stars. Daytime temperatures shoot up, and most visitors to the island want to spend the better part of the day on the seaside. Sun, sun, and more sun! In July, temperatures reach their annual highs and in the middle of the day it can be unpleasant to be out walking and hiking. The sea temperatures, however, are perfectly comfortable for long, refreshing swims. Shorts, sandals, and wide-brimmed sun hats: this is the perfect “Capri Style” summer look, with linen and cotton holding center stage. Be careful about your choice of shoes, as walking in high heels isn't an easy feat along the steep cobblestone streets on Capri. Better to opt for flat sandals, a classic island fashion. The best way to escape the high season crowds this month is to rent a boat and set sail for the tiny hidden coves and bays accessible only by sea, dive in, and cool off before stopping at a waterfront restaurant on the island of the Amalfi Coast for a plate of "spaghetti alle vongole". By night, you can dive in...to the vibrant nightlife on Capri. Everything happens in and around the Piazzetta in Capri, where islanders and visitors gather for an aperitivo, stroll down Via Camerelle, and then meet up after dinner to dance in a "taverna". 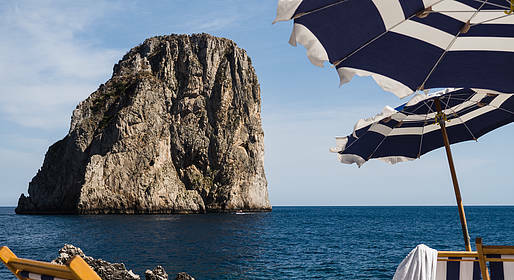 The classic way to spend a summer's day on Capri is on the beach. Most beach clubs on the island have a limited number of spaces, so make sure you reserve in advance in high season!